A business with a large space to cool can count on the HECD evaporative cooling system. 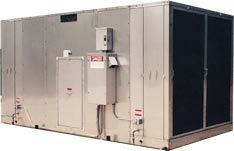 HECD systems are the efficient way to cool...at 1/5 the cost of mechanical air conditioning. The innovative evaporative cooling media provides simple and efficient evaporative cooling using water, not refrigerants. Capacities up to 60,000 cfm are available. Water sumps and cooling sections are solid stainless steel. Units are AMCA certified.